Inferring the correspondences between consecutive video frames with high accuracy is essential for many medical image processing and computer vision tasks (e.g. image mosaicking, 3D scene reconstruction). Image correspondences can be computed by feature extraction and matching algorithms, which are computationally expensive and are challenged by low texture frames. Convolutional neural networks (CNN) can estimate dense image correspondences with high accuracy, but lack of labeled data especially in medical imaging does not allow end-to-end supervised training. 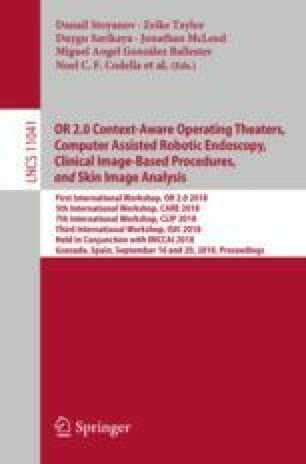 In this paper, we present an unsupervised learning method to estimate dense image correspondences (DIC) between endoscopy frames by developing a new CNN model, called the EndoRegNet. Our proposed network has three distinguishing aspects: a local DIC estimator, a polynomial image transformer which regularizes local correspondences and a visibility mask which refines image correspondences. The EndoRegNet was trained on a mix of simulated and real endoscopy video frames, while its performance was evaluated on real endoscopy frames. We compared the results of EndoRegNet with traditional feature-based image registration. Our results show that EndoRegNet can provide faster and more accurate image correspondences estimation. It can also effectively deal with deformations and occlusions which are common in endoscopy video frames without requiring any labeled data. We gratefully acknowledge the support of NVIDIA Corporation with the donation of the Titan X Pascal GPU used for this research.